Owing to too many other commitments at the moment I am unable to lead a ride this month. The next ride will be on Sunday 17th March. The public enquiry for Muddy Lane resumes tomorrow. It is being held at the Woking Borough Council Civic Offices, Gloucester Square, Woking, GU21 6YL starting at 10:00am. Depending on how many people wish to speak and any new issues that arise, the session may last for one or for two days. All members of the public are entitled to speak at a public enquiry (that’s the whole purpose of them). If you have used Muddy Lane at any time in the past and would like to speak then please come along tomorrow. If you are interested in the proceedings but don’t want to speak you can also attend and listen to what happens. The more people that attend the enquiry the more it shows public support for the change of status, so if you want to show support then I would encourage you to come along. For sure there will be some discussion tomorrow about no-entry signs, the height of the bridge under the motorway, and possibly other new challenges might be submitted at the last minute as happened last time. It will not be dull. Our ride this month will be Sunday 9th December at 10:00am, followed by Christmas Lunch, for those who have booked, at the Jolly Farmer. We meet outside the Hand & Spear pub near Weybridge Station, and the route will be about 35 kilometers on a mix of main and quieter roads. We will head out towards Hersham and Molesey before crossing Bushey Park as we aim for Strawberry Hill. From there we pick up the path through Crane Park until we reach the A316. Here we turn for home, taking the series of connecting paths that run parallel to the 316. In Sunbury we head for Walton Bridge and then the secret cyclepath back into Weybridge by about 1pm. 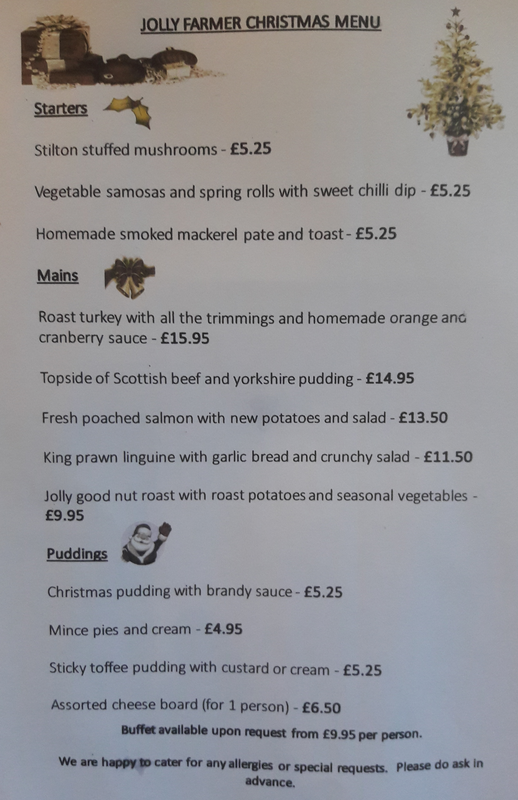 For those that have booked (you know who you are) we will finish at the Jolly Farmer for a festive lunch. The ride will be on a mix of quiet and busier roads and a few bits of cycle path. The total distance will be about 35km, which is around 20 miles. If you want to come on the ride, you can just turn up. Our next ride will be on Sunday 13th January. Our next ride, on Sunday 9th December, will be followed by our Christmas Lunch. As usual it will be at the Jolly Farmer in Princes Road, Weybridge. The ride will start at 10am outside the Hand and Spear at Weybridge Station. It will finish at 1pm at the Jolly Farmer. If you would like to come to the Christmas Lunch please let me know by Saturday 1st December so that I can confirm numbers with the restaurant. Please also let me know your food selection from the menu here. Details of the ride route will be sent out, as usual, a few days before the ride. If you just want to come on the ride, but don’t want to stay for the Christmas Lunch, then you can just turn up on the day, there is no need to let me know. 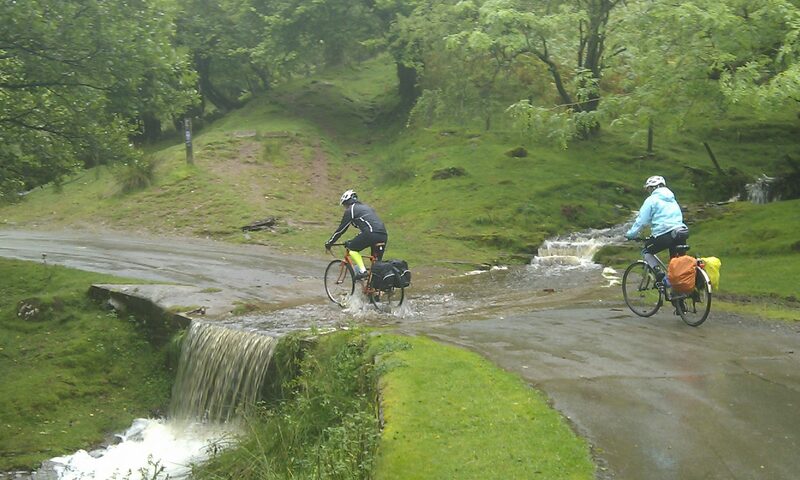 Our ride this month will be this Sunday 21st, not as previously advised, last Sunday, because that was a washout. So, this Sunday we will be joining up with the Woking Cycle User Group to visit Virginia Water and Windsor Great Park. The ride will start later than usual at 1pm. We meet outside the Hand & Spear pub near Weybridge Station, and the route will be about 20 miles on a mix of roads and paths. We will head out through Brooklands Park then pick up the Basingstoke Canal all the way into Woking where we will meet up with the Woking lot at 2pm. Sandra will then lead us to Virginia Water and on to Windsor Great Park where there will be a detour to see the Acers which should be in fine colours at this time of year. It’s anybody’s guess what the route back will be. Our next ride will be on Sunday 11th November, and Sunday 9th December will be our usual Christmas Lunch ride. This Sunday we will be going to Virginia Water and Windsor Great Park. The ride will start at 10:00am outside the Hand & Spear pub near Weybridge Station, and will be about 25 miles on a mix of roads and paths. Our outbound route will take us through Virginia Water to Windsor Great Park. From there we head back towards Egham and Staines where we pick up the riverside towpath back to Weybridge via Chertsey Bridge. Lunch will be at a pub in either Egham or Staines, depending. The ride will be on a mix of quiet and busier roads and a few bits of cycle path. The total distance will be about 40km, which is around 25 miles. Our next ride will be on Sunday 14th October. This Sunday is our all day ride, we will be going to Henley-on-Thames. The ride will start at 8:00am outside the Hand & Spear pub near Weybridge Station, and will be about 60 miles on a mix of roads and paths. Our outbound route will take us through Virginia Water and Windsor Great Park and then past White Waltham airfield, over Knowl Hill and down into Henley. The return leg will be via Remenham, Hurley, Maidenhead, Bray and Eton. I expect we will be back in Weybridge around 5 or 6pm. The ride will be on a mix of quiet and busier roads and a few bits of cycle path. The total distance will be about 100km, which is around 60 miles. Our next ride will be on Sunday 9th September. This Sunday our ride will feature a picnic and, optionally, a dip in the River Wey. The ride will start at 10:00am outside the Hand & Spear pub near Weybridge Station, and will be about 20 miles on a mix of quiet roads and paths. Starting from Weybridge we will head south along Redhill Road and then towards Downside. After crossing Bookham Common we will circle back through Effingham, East Horsley and Ripley until we reach the River Wey near Newark Priory. We will stop here for a picnic. There are no facilities here so please bring everything you need. For anyone adventurous enough there’s a chance to paddle or swim in the river. The route is on a mainly quiet roads and cycle paths. The total distance will be about 35km, which is around 20 miles. Our next ride will be on Sunday 12th August. Weather permitting this will be an all day ride. In a change to the scheduled programme, our next ride will be this Sunday, 10th June, not next Sunday. We will be joining an organized cycle ride visiting gardens that are part of Open Garden Squares. We will meet at the usual location outside the Hand & Spear at Weybridge Station, at 9:00am. That’s an hour earlier than normal. The total ride distance, starting and finishing in Weybridge will be about 40 miles. We should be back in Weybridge by about 6:30pm. If you want to come on the ride, you can just turn up but do try to buy a ticket for the gardens in advance. Our next ride will be on Sunday 8th July. This Sunday, 1st April is our annual Egg Hunt. Starting from the Hand & Spear at Weybridge Station at 10am on Sunday our Egg Hunt will take you on a tour of the area looking for eggs. In teams of two or three cyclists, and using a map and a clue sheet you will have 3 hours to find as many answers as possible. You can ride in a team of two or three. Don’t worry if you don’t already have a buddy to ride with, you can be paired up with someone suitable at the start. There will be no fixed route, but expect to cycle around 20 miles or so. The start will be at the usual place, outside the Hand and Spear pub near Weybridge Station at 10am. You will finish back at the same place by about noon. There may well be prizes for a good performance. Last year Hannah and Matt aced it, getting full marks in record time, so this year the clues are going to be even more fiendish and devious, and don’t forget it will be April 1st, so keep your wits about you. If you want to come, just turn up. The next ride after this will be on Sunday 13th May at 10am. Our ride this month is this Sunday 17th December. It’s an out and back ride to Kingston, followed by Christmas Lunch at the Jolly Farmer in Weybridge. The ride will start at 10am outside the Hand and Spear at Weybridge Station. It will end at 1pm at the Jolly Farmer. If you want to join us for Christmas Lunch you should already have let me know. If you haven’t you might still be able to get lunch but you’ll have to take your chances. The full route is here: https://www.strava.com/routes/11373257 it’s about 35km or about 20 miles, mainly on-road but with a bit of towpath along the river by Hampton Court. Our next ride will be Sunday 14th January.